When USC drummed Ohio State, 35-3, last September, the game was like an NFL exhibition. Over the weekend in the NFL Draft, the Trojans beat the Buckeyes again, but no other school did. With cornerback Donald Washington (Kansas City) and receiver Brian Hartline (Miami) selected in the fourth round Sunday and linebacker Marcus Freeman taken in the fifth round (Chicago), Ohio State finished with seven players taken in the seven-round draft, after Malcolm Jenkins and Chris "Beanie" Wells went in Saturday's first round and James Laurinaitis and Brian Robiskie went in the second. That tied Oregon State and South Carolina for the second-most picks, behind the 11 the Trojans produced, including eight on the defensive side. No wonder Ohio State didn't score a touchdown in that game. But the day ended without a selection for OSU offensive tackle Alex Boone, defensive tackle Nader Abdallah and quarterback Todd Boeckman. Boone, a Lakewood St. Edward grad, signed as a free agent with the San Francisco 49ers shortly after the draft. "It was a humbling experience, that's for sure," Boone said of watching the draft all day. He was projected as a high pick before his senior season at Ohio State, but saw his status affected by an arrest in California for public intoxication before the NFL Combine. "I learned some lessons the hard way," Boone said. "But the 49ers called and were very interested and pushing for me, and right now it's the best fit for me." Freeman was picked, but he also waited and went lower than many expected. "You go through a mixture of emotions," Freeman said after he was the 17th linebacker selected and the 154th overall pick. "Once you get out of the first couple of rounds you go from excited to anxious to nervous to disappointed. But once it's over, it's over, and your emotions go out the window and you're relieved to be able to go and play." Washington, pick No. 102, and Hartline, No. 108, had to be somewhat satisfied with their positions after they had turned heads at the NFL Combine, Washington with his vertical jump and athleticism and Hartline with his agility and quickness. Kansas City coach Todd Haley said the Chiefs thought about moving up to get Washington in the third round and were happy he fell to them in the fourth. Washington was suspended for two games for violating OSU team rules last season, but Haley said the Chiefs put that to rest after meeting with Washington for a day-and-a-half and talking extensively with OSU coaches and agent Neil Cornrich before the draft. "He's a very good athlete, I mean very good," Haley said at a news conference in Kansas City. "I think he's under the radar just a little bit because he didn't start full time last year." Hartline is expected to work in as a slot receiver, though Miami selected one of those USC players, receiver Patrick Turner, ahead of him in the third round. Hartline should also be a special teamer with the Dolphins, telling reporters on a conference call that he liked "cracking heads" on kick coverage. 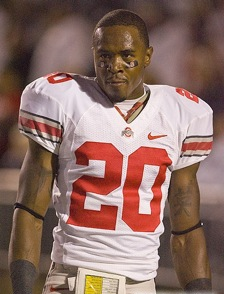 He'll join fellow former Cleveland Glenville High and OSU receiver Ted Ginn Jr. in Miami, though he said his best NFL comparison is his OSU mentor, Cleveland St. Ignatius graduate Anthony Gonzalez of the Indianapolis Colts. Considering both Washington and Hartline surprised some fans by turning pro as juniors, they at least didn't have to wait too long on the draft's second day. 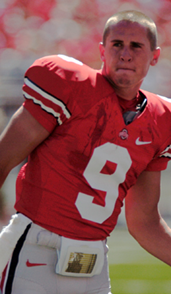 "After I went to the combine I felt a lot better about my decision," Hartline said on a conference call. "It worked out. It's hard to justify what exactly made me decide to further my career [in the NFL], but Ohio State was great to me, and hopefully one day I can repay the favor."